Apartment in Bedar, Nr. Mojacar, Almeria, Spain. Stunning mountain views & within easy reach of the beach. Spacious one bedroom apartment with very large balcony and wonderful panoramic views to the sea and mountains. Set in the beautiful whitewashed village of Bedar. Modern fitted kitchen and bathroom. Free 10MB Wifi. Sleeps a maximum of two adults and a child on the sofa-bed in the sitting room. The apartment is fully fitted with ducted air-conditioning which also provides heating in the winter months. Ceiling fans are fitted in all rooms. The balcony has a table with parasol and four comfortable chairs as well as a pair of loungers. I currently live in rural Angus, Scotland with my husband Gordon and three little terriers. I'm Val, a gardener on an estate and I love being outdoors. We would love to eventually retire to Bedar, but that is still some years away! We chose Bedar for our holiday home as it is such a pretty little village. The apartment is new but it is in the heart of the characterful pueblo blanco. The village is peaceful, always room to park, very stress free. The area is very beautiful and not too 'touristy'. We are delighted with our little apartment and wouldn't change a thing. We hope our guests feel the same! The large balcony is a great bonus of our property. We have spent many happy hours relaxing there. We never tire or wandering through the village streets smelling the jasmine. There are enough bars and restaurants in the village to satisfy most tastes so it is possible to just stay put in the evening and not always have to drive. Fully tiled brand new en-suite bathroom to bedroom 1 with bath, shower, bidet and wc. Washing machine and drying line on balcony. Lounge with double sofa-bed, double patio doors leading to expansive balcony. Brand new fitted kitchen using local granite. Cooker with Halogen hob, electric oven, grill, fridge and kettle. Iron/ironing board. The balcony is ideal for dining al fresco. IPTV providing range of English language channels. Large private balcony with sun loungers and table and chairs. There are several golf courses, including the renowned Desert Springs Resort, mostly within 20 mins by car. Unfortunately there is a flight of stairs up to the apartment. Outside: Large private balcony accessed via patio doors leading from the living room. Table with parasol and four comfortable chairs. In the summer months the balcony gets direct sunlight all day. Cleaning / Towels / Linen / Maid service: Towels and linen are included and the apartment is cleaned after every rental period. A lovely apartment in beautiful Bedar. The apartment has wonderful views and is fully equipped for a couple. The owners answered any questions I had promptly and they arranged for a meet & greet that was punctual and very friendly on arrival. Me & my husband had a wonderful holiday. We hired a car for our stay which is definitely needed for the area as it is about 9 miles to the coast. Mojácar is definitely worth a visit. We ate at the local restaurant called Miramar the shoulder of lamb is delicious and needs to be shared between a least a couple of people. We went to the local bar one night which was great the cost of wine was very reasonable and there was a couple of singers on which were really talented. Overall we can recommend this apartment for a nice quiet relaxing holiday. The apartment is set in a historic Spanish village which has a lot of character and interests. It has all the facilities for a lovely relaxing holiday with a balcony which has stunning views out to sea and the surrounding hills. The town has several restaurants to suit most tastes and for those who want more it is a short drive to Mojacar and other towns. We stayed during the local fiesta which we found fascinating to experience the celebration of the local history. This was our first experience of booking through Owners Direct / HomeAway and found it an ideal site for finding and booking the property. This was enhanced by communications with the owner who was very helpful. We enjoyed our stay very much and would definitely stay there again. Thank you very much for your lovely review. It is always good to be in Bedar at fiesta time! We had a wonderful holiday in this lovely apartment in Bedar. The apartment had everything you needed and was clean and bright. The balcony was a great place to sit and enjoy the spectacular views of the mountains in one direction and the sea in the other. We walked around the village and the locals were really nice - always said Hola! We ate in the four restaurants and food was delicious in all! We drove down to the coast to Mojocar and Garrucha and Vera All in all we had a relaxing time. Would definitely recommend ! Thank you for your lovely review Sue. Glad you both had a good holiday in Bedar. Great place in the village of Bedar, it is a great place to stay, we took our little Dog who enjoyed it as much as we did, the accommodation is right for 2 people and it has Air con which was needed on a few nights. There are restaurants/Bars close and if you dont want to go out the Kitchen is fully fitted for that. The Balcony is so good with Lovely Views we could sit there all day. Thank you very much for your kind review. Our dogs always enjoy holidays in Bedar too! So glad you enjoyed your stay. We stayed at this apartment for a week in July. Although we arrived late evening, the meet & greet service were really helpful and met us nearby to show us to the apartment. The accommodation was clean, comfortable and well-equipped for a short stay and also had plenty of books etc if needed. 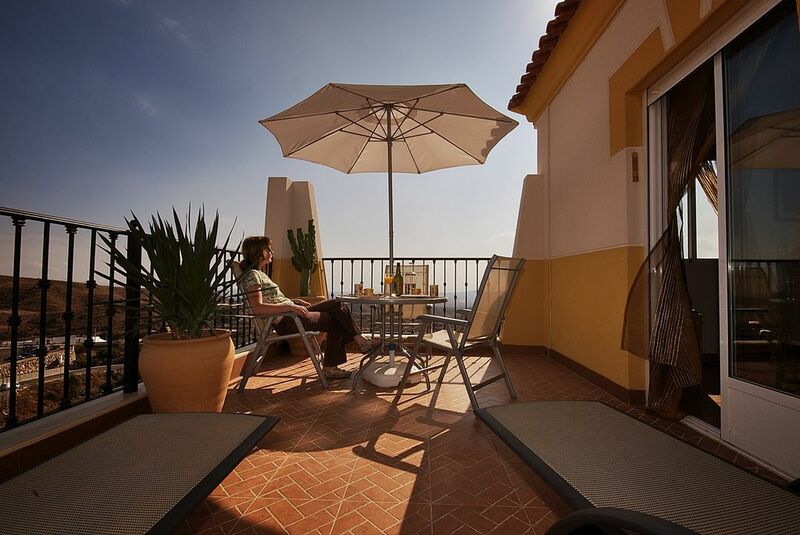 It has a large terrace with fantastic views down to the coast and over the surrounding mountains. We particularly the nearby Miramar restaurant. Overall, this property was well-located for us to explore the surrounding area and villages as well as providing a lovely location to relax at the end of the day. Thank you so much for your lovely review. I am very happy you had a good holiday and enjoyed your stay in Bedar. Lovely apartment and great size terrace with fantastic views. Some really good restaurants in the village, recommend El Mirador and the local Indian restaurant. Glad you enjoyed your holiday, thank you very much for your review. Mojacar Playa is within 20 mins by car. Theses beaches are vast and plentiful with all the usual facilities (cafes, bars, restaurants and shops in abundance). There are harbours at Garrucha and Carboneras. Almeria airport 45 miles (45 mins on excellent roads). Murcia airport 118 miles (1.5 hours on excellent roads). Alicante airport 134 miles (2 hours on excellent roads). Car hire is advised. Turre 8.5 miles. Mojacar Pueblo 11 miles. Vera 12 miles. Cabo de Gata 30 miles. Carboneras 33 miles. Chemist, bank, supermarket, bakery, tobacconist within 5 mins walk. Five bars with restaurants and occasional live entertainment. The village has its own open-air municipal swimming pool. If you're looking for a place to get away from it all it can be done here. Everything you'll need is available within easy walking distance. For those looking for more in the way of night-life Mojacar Playa is easily accessible by car. The surrounding hills offer fabulous walking opportunities with truly breathtaking views to the Mediterranean. Photographers are also well catered for with various wildlife, beautiful village settings and the coast only 20 mins away. Booking Notes: A 25% non-refundable deposit is required to confirm a reservation with the balance being due 8 weeks before arrival. We can be contacted any time via email or telephone to discuss your individual requirements before booking. We will be as flexible as possible to make your stay enjoyable. Changeover Day: Changeover day is flexible. Day of arrival: Entry to apartment after 4.30pm. Day of departure: Depart by 10.30am. We will be flexible on these times if we possibly can. Notes on prices: Prices are for the property per week in UK Pounds Sterling. All letting rates include linen, towels, heating, electricity and taxes. A welcome pack can be supplied if required at a small additional charge.